The very survival of the planet is at risk: human misuse of natural resources and disturbance of natural environmental systems is pushing the Earth to the limits of its capacity. 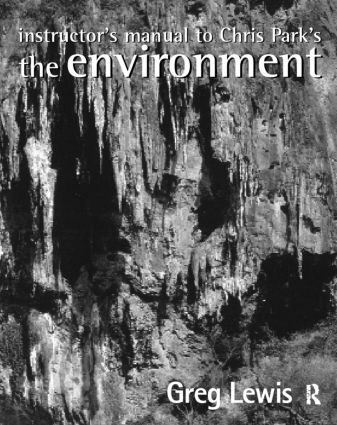 The Environment is a lively, comprehensive introduction for environmental study, explaining how the environment functions, how environmental systems relate, and the ways in which people and environment interact. Focussing particularly on the environmental impacts of human activities, the book explains the ways in which an understanding of basic physical principles can help us to use the environment and its resources. * a global perspective - incorporating stimulating examples drawn from around the world to illustrate broad global patterns and contrasts. The Environment explains the principles and applications of the different parts of the Earth's system: the lithosphere, the atmosphere, the hydrosphere, and explains the interrelationship across these systems. It explores the present environmental crisis, examines how the planet Earth fits into the wider universe, and explores human-environment interactions, to offer a clear understanding of the diverse and complex environment we live in and new ways of thinking about the way it is changing.